Discussion in Product Reviews started by Beast_Titan • Nov 19, 2017. I want to review White Flower oil. 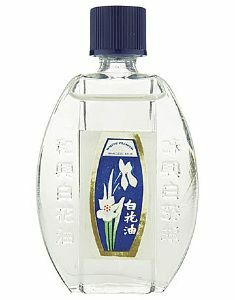 It is a topical pain killer/massage oil from Taiwan. You can but it online and some Asian stores. It is very cheap and it has many uses. It can ease pain or itch by rubbing it in the painful area. I usually rub it on my elbows and knees. It is also useful as a decongestant or vapor rub for people with colds. I rub some on my chest and my back. I smell the hand I used for rubbing because it has the scent of the lavender and mint so it is an alternative for inhalers too. It is made of Mint oil and Lavender oil and it has many uses. I prefer using this topical pain killers over pain pills. I think topical pain killers are more safe. White Flower was a very popular remedy for travel sickness when I was a child. It was an indispensable first aid remedy for insect bites, nausea, and a host of other symptoms back then. I love its smell and it always felt like I was getting lots of TLC from my grandmother whenever she rubs it on my skin or on my pillow. I had forgotten all about it when I moved to the big city where there are tons of ointments and commercial products to choose from. It has resurfaced a few years ago when people rediscovered the wonders of essential oils. Currently, however, there are much cheaper alternatives to White Flower and they are as effective. Locally, we can buy either Efficascent Oil or Superscent Oil which has menthol, camphor, and eucalyptus oil as ingredients. They can help alleviate rheumatism, stiff neck, muscular and joint pains, and skin irritation and are more widely available than White Flower. Vicks Vaporub had also been effective for relieving symptoms of cough and cold including nose congestion. I don't like Vicks that much, it is not that strong of a linement. I prefer white flower because it is cheap and it is available on my area. It is also available online. It is I also like the fact that it doesn't have the disgusting oily or creamy texture other topical pain killers have. The product is widely used by a lot of people, and it definitely has a lot of positive reviews on social media websites, need to try it. I have never heard of this product but it is something I would be very interested in especially as I have just suffered a 7 week virus where I felt very poorly and congested. I don't like the smell of Vick but I do like the smell of lavender and mint. I wonder if it is available in local health shops in the UK. Also my granddaughter suffers from very bad travel sickness so it might work for her. It is available on Amazon and eBay. Asian stores also sells them. I buy them wholesale online. Recently I am considering to DIY this. I am planning to mix lavander essential oil, Mint essential oil and ginger essential oil so I can have my very own home version. Since I was a kid, this topical pain killer, the White Flower was already commonly used by the travelers to get rid of their dizziness while traveling. This was also used to relieve headache, toothache, among others. It is very useful. As of this writing, we are still using this White Flower.